Imagine starring in a music video only to find out at the end of the final scene that the whole production was an elaborate ruse cooked up by your boyfriend to deliver the most unforgettable marriage proposal. Well, that’s the story of childhood sweethearts Sam and Jess, and Sam’s musically talented cousin, Matty Mac. Welcome to Music Friday when we regularly bring your great songs with jewelry, gemstones or precious metals in the title or lyrics. Today, we bend the rules a bit to spotlight “The Proposal,” a brand new song written and performed by the 24-year-old Mac. Although the song does have a reference to a "golden road," what makes the song really unique is that it was written especially for Sam and Jess's marriage proposal. The two attended dances together as far back as middle school and have known each other since they were 10 years old. According to Fox29, Sam was looking to surprise Jess with an over-the-top proposal, so he asked his cousin if he could pop the question in one of his music videos. Mac liked the idea, but didn’t have any material that matched the “proposal” theme. “I knew… I would need a song that was going to live up to the feeling and emotions that would capture that moment," Mac said. Sam loved the song, so the next step was creating a fake music video. Sam convinced Jess that cousin Matty needed them to star in his latest production. She agreed. 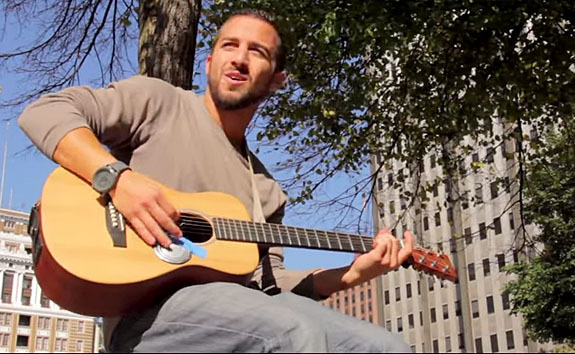 The video begins in Philadelphia’s Love Park, where the editor mixes romantic shots of the couple with performance shots of the singer. The next scene shows the couple enjoying a romantic dinner at Gervasi’s Restaurant, where Mac is entertaining the patrons. The extras in the scene are friends and relatives of the couple. As the singer reaches the last verse — “Tell me you'll love me till our final days / ‘Cause I've been hoping' that you'd marry me someday” — the actual proposal is set in motion. Jess holds her hand to her face in shock as Sam goes down to one knee and proposes to the love of his life. “Of course, I would,” she said. After the couple embraced, they were swamped by well wishing family and friends. There were a lot of smiles and even more happy tears. Mac posted the resulting video on YouTube on May 22, 2015. Over the past four weeks the video was seen more than 680,000 times and has been featured on Inside Edition. “The Proposal” is the title track of Mac’s newest album, which is available on iTunes. Please check out the viral video at the end of this post. The lyrics are below if you’d like to sing along. Written and performed by Matty Mac. Tell me that you wouldn't have it any other way. Tell me now before I turn and walk away. Every little thing you say and do. When you looked at me and said you felt it too. Grab me around my waist, don't let me walk away. Tell me I'm all yours, tell me today. Tell me I warm your soul when clouds are cloudy grey. And I pray you feel the same. ‘Cause I've been thinking' about giving you my last name. And the most insane must be waking up without you next to me. I don't want to wake without you next to me. Tell me that I'm the one you'll call your "ball and chain." Tell me you'll die if we don't kiss every day. I'll be the mister, if you will my misses. And I'll be the wizard to grant you all of your wishes. I'll put my queen atop her throne. I'll come home with chocolates and a red bouquet. We'll stay in color while the world's in black and grey. Grab me around my waist and don't let me walk away. ‘Cause I've been hoping' that you'd marry me someday. Did You Hear About the Guy Who Designed an Engagement Ring Adorned With Fragments of His Amputated Tibia? The internet is abuzz with the story of Mike Perrett, a British amputee who designed an engagement ring adorned with fragments of his shattered right tibia. 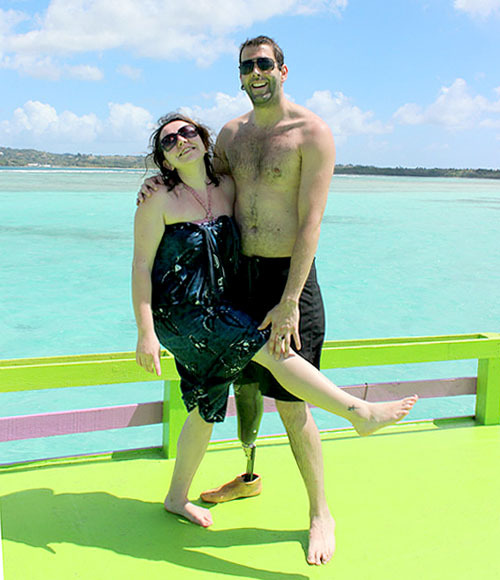 Perrett lost his right leg while volunteering for an Indian orphanage in 2006. He was playing volleyball with the children when the ball went astray and headed for a cliff. Perrett tried to save the ball, but lost his balance and fell 120 feet. Perrett might have died had it not been for his right leg taking the brunt of the impact. Although doctors did attempt to save the leg, the injury wouldn’t heal and the leg had to be amputated. He worked with London-based jeweler Ingle & Rhode to create a one-of-a-kind symbol of their love — a ring so personal that it would, literally, be a part of him. 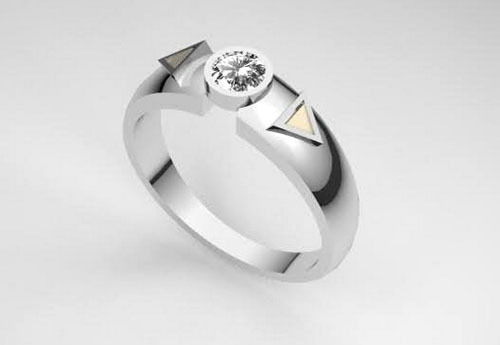 The modern platinum ring features two triangular inlays of human bone centered by a traditional round .25-carat white diamond. The design file, above, shows the inlays rendered in yellow metal. The ring at the top of this post shows Melita wearing the actual ring with the bone inlays. 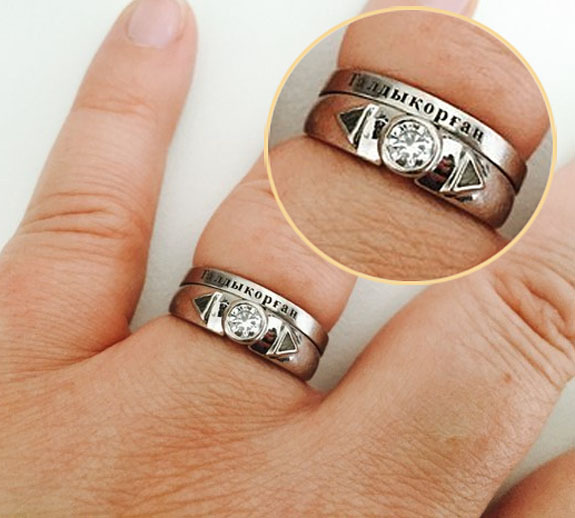 Melita told the popular social news website that she loves her ring because of the depth of symbolism behind it. “I guess why it’s so special to me is because... it shows him bravely coming to terms with something like that so positively… which has to be a good attribute for marriage,” she said. If you’re wondering if there’s something not so sanitary about using human bones in jewelry, don’t fear. The bones were completely sterilized before they were fabricated into the engagement ring. 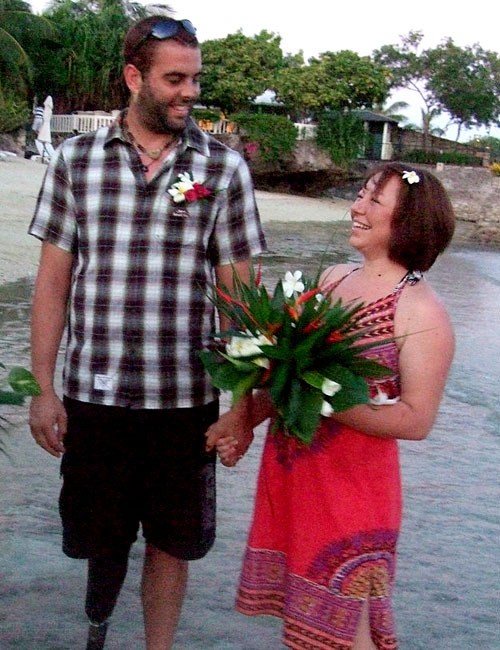 The couple married on a beach in the Philippines in November 2011. They currently live in Guernsey, a British isle just eight miles off the coast of France. They have one child and another on the way. The bone-inlay engagement ring was not Perrett's first foray into this unusual jewelry. He told News of the World in 2010 that he bought a Dremel multi-tool to form shin bone fragments into jewelry for himself and other members of his family. “The first pieces I made were a necklace and an earring for myself, and cufflinks for my dad,” he said. Images: Melita and Mike Perrett. Design file of the ring by Ingle & Rhode. Luxurious jewelry owned by the original “Kelly Girl,” Margaret Adderley Kelly, headlined yesterday’s Important Jewels sale at Christie’s New York, and the featured lot of the day — The Kelly Sapphire — lived up to its top billing with a hammer price of $4.2 million. 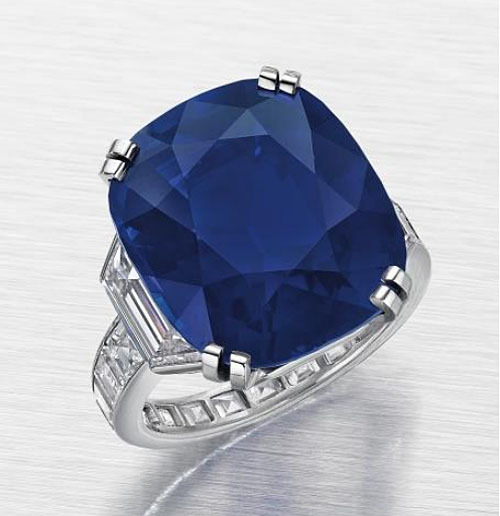 The 21.71-carat Kashmir sapphire and diamond ring by Cartier shattered Christie’s pre-sale high estimate of $2 million. The cushion-cut sapphire is flanked on each side by a trapezoid-shaped diamond and is mounted in platinum. Kelly lived the American Dream. 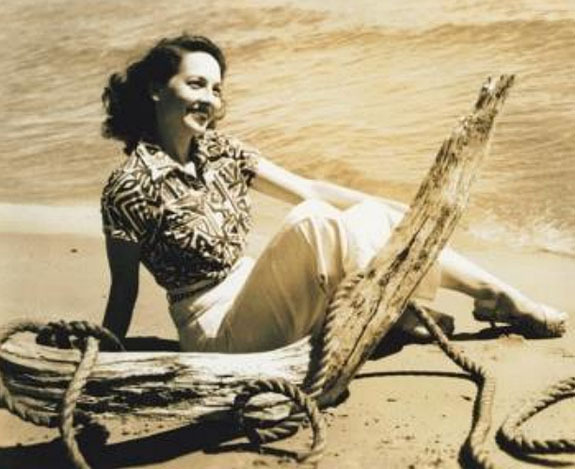 Encouraged by the post-WWII economic boom, Margaret and her husband, William R. Kelly, established Russell Kelly Office Service in Detroit in 1946. By 1957, the pair had transformed the modest "temp" business into the iconic “Kelly Girl” dynasty, a Fortune 500 company that currently employs more than a half million people worldwide. Beyond her business acumen and dedication to philanthropy, Kelly was passionate about jewels and fine gemstones. Christie’s explained that she collected with the discerning eye of a great connoisseur. Among the 232 lots up for sale at Christie’s New York were 28 items from Kelly’s collection. 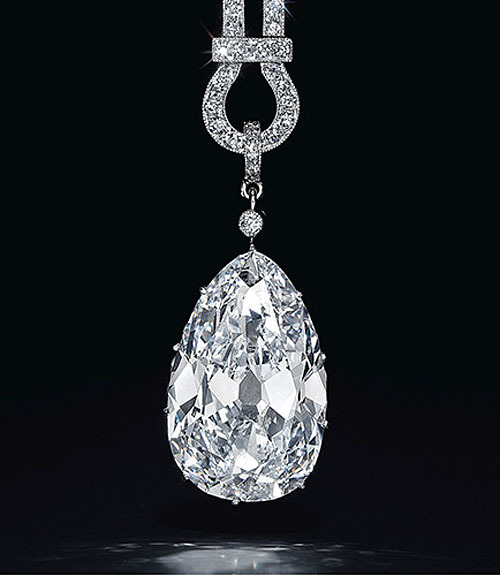 A particularly impressive Kelly piece adorned the cover of Christie’s “Important Jewels” auction catalog. It’s an Art Deco diamond pendant necklace suspending a D-color, internally flawless pear-shaped diamond weighing 16.24 carats. The piece, which is dated circa 1920, fetched $2.23 million — well above the pre-sale estimated price of $1.6 million to $2 million. The diamond was certified to be of Type IIa clarity, the most chemically pure of all diamonds. 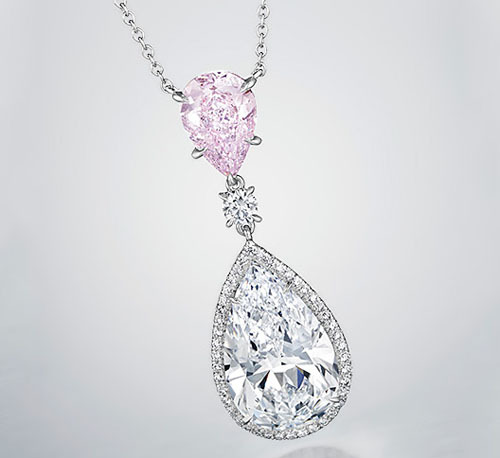 A third noteworthy item from Kelly's collection is this diamond pendant necklace featuring a pear-shaped white diamond weighing 5.06 carats framed in a halo of smaller round diamonds and accented with a fancy purplish-pink diamond weighing 1.68 carats. The hammer price of $317,000 was within the range of the pre-sale estimate of $280,000 to $350,000. Weighing more than a quarter-pound and gleaming with 205 diamonds, the New England Patriots’ Super Bowl XLIX Championship rings are the biggest ever. Patriots’ owner Robert Kraft presented the enormous oval-shape rings to players and staff during a private party at his home on Sunday night. The rings commemorate the team’s fourth Super Bowl title — an electrifying 28-24 comeback win against the Seattle Seahawks. The National Football League seems to maintain an unwritten rule that allows teams with multiple Super Bowl victories to design the biggest and “blingiest” rings. In the case of the four-time Lombardi-trophy-winning Patriots, the sky was the limit. "I have been blessed to host four Super Bowl ring ceremonies, and just like the rings we present, we have tried to make each ceremony a little bigger and a little better than the one before," said Kraft. 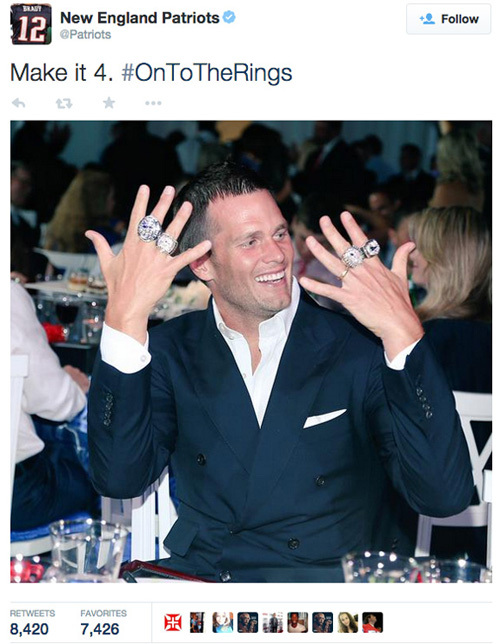 For the Pats, the rings are, indeed, getting bigger and better than the ones before. In 2001, the team’s first Super Bowl ring weighed in at 74 grams. Two years later, its second Super Bowl ring weighed 100 grams. The next year, 2004, the Pat’s third Super Bowl ring tipped the scales at 110 grams (just under one-quarter pound). While the newest Super Bowl ring appears to be at least 20 percent larger than the one from 2004, ring manufacturer Jostens could not provide us with the exact specs on the weight. The company did confirm that each ring is set with 205 diamonds weighing a minimum of 4.85 carats. 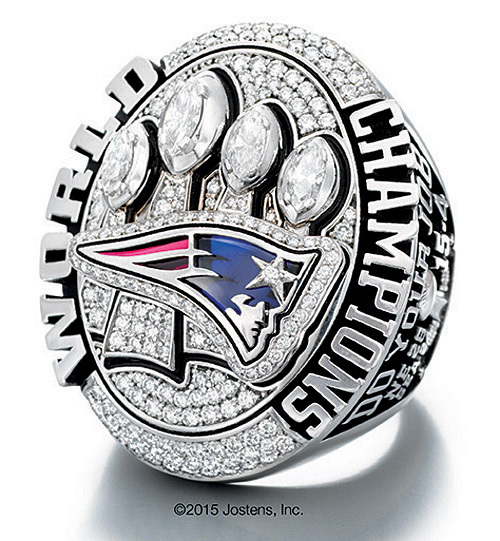 The front of the Super Bowl XLIX Championship ring features the Patriots’ red, white and blue logo swooping across four Lombardi Trophies in a ground of 143 round pavé diamonds. A marquise-cut diamond represents the football symbol at the top of each trophy. The words WORLD and CHAMPIONS are written in raised letters on the perimeter of the ring face. The right side of the ring features the season's motto DO YOUR JOB, the final score of the championship game, the team’s season record and the Super Bowl XLIX logo. The opposite side lists each of the championship years (2001, 2003, 2004, 2014), a rendering of Gillette Stadium, as well as the player's name and number. 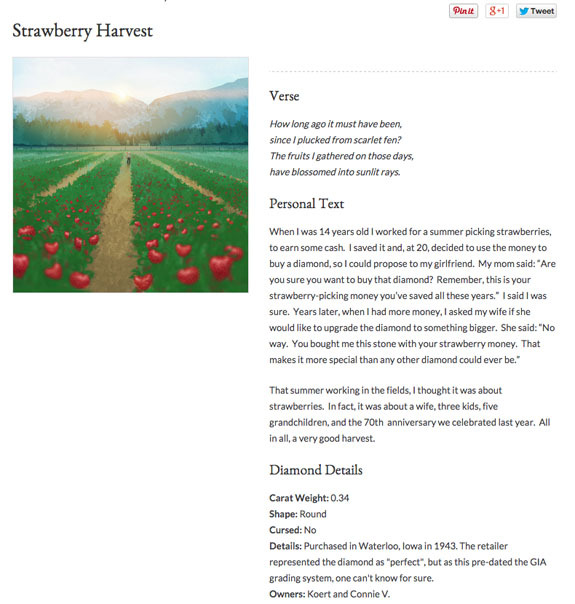 The example shown above is the owner’s ring. The interior of the ring features a second team motto. “We are all Patriots” is a phrase the owner coined after the Super Bowl victory in early February. Kraft’s signature and the date of the Super Bowl are also inscribed on the interior. The NFL awards 150 rings to the Super Bowl victor and spends approximately $7,000 per ring — although teams with multiple Super Bowl victories are allotted a higher budget for diamonds. Teams often create “B” and “C” level rings — designs with faux diamonds or fewer diamonds — for distribution to the front office staff. Photos: Jostens, Twitter/New England Patriots.